Rank 1 : Cash award of US Dollar 150 along with certificate of merit. Rank 2 : Cash award of US Dollar 100 along with certificate of merit. Rank 3 : Cash award of US Dollar 50 along with certificate of merit. There will be 5 problems in increasing difficulty level. Problem 1 being the easiest and Problem 5 being the hardest. All the problems have same points alloted to them. After successfully solving a problem, come back to the contest page, and the next problem should be unlocked for you. You might have to wait for upto 20 seconds for this. Level of questions will be of International Physics Olympiad (IPhO) Level. The age limit will be 24 years and it can be verified considering social security numbers like Adhar card no., pan no., driving license no., etc. Questions may contain text, equations, alphanumeric characters, diagrams, graphs, images, charts, integral or differential equations, matrices, etc. Answer will not be MCQ type but may contain numeric, alphanumeric, decimal, mathematical functions, trigonometric expressions, graphs, diagrams, etc. You will have maximum 3 attempts to answer each question and the participants will be ranked according to the number of problems that they have solved. Ties will be broken according to the time taken to reach that score. So, the user who first solves all 5 problems will be the winner. To solve a problem, click on the Submit button from the problem page, and type the exact answer in the box which says "Please insert your source code", and press Submit. For example, if the answer is ten, type only "10", without the quotes. You are cordially invited to give your suggestions to successfully conduct this online Olympiad. Please contact santosh.chakraborty84@gmail.com for any queries during the contest. 17 Jan 2019, 10:15 IST: Congratulations to all the UEMPhO-19 rank holders. Top 10 rank holders are requested to fill up the form given in the following link. It is mandatory for disbursement of winning prizes and certificates. 11 Jan 2019, 19:11 IST: Please use the non-IDE mode if you are facing any issues while submitting. You can find this button on the top left side of the submit page. 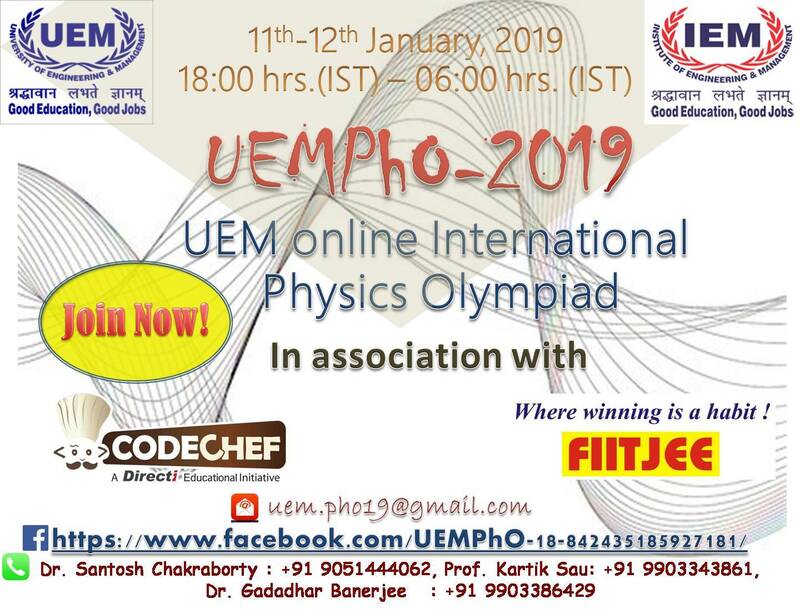 We are happy to announce that University of Engineering & Management, Kolkata (IEM-Group) is organizing the online International Physics Olympiad (UEMPhO-2019) in association with FIITJEE and codechef. It is scheduled to be held on 11th January, 2019. It is a great opportunity for students preparing for International Physics Olympiad (IPhO) or any Physics lover to test their ability. Participants can appear for the exam from their home using the online platform. Registration is completely free and they can win exciting prizes (Amazon Gift cards worth $300 and Certificates). We request you to encourage each and every student to register in UEMPhO-2019.